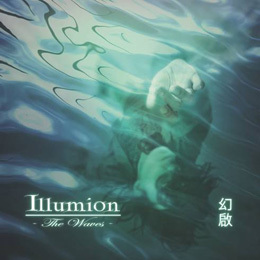 Dutch Prog band Illumion was formed in 2002 by guitarist Eveline van Kampen. In 2004 the band’s first three song demo, ‘Into the labyrinth’ was released, and this was followed two years later by ‘Into the labyrinth part 2′ which contained six songs including three covers. In 2009 the band released their debut album, ‘Hunting for significance’. The second album,‘The Waves’has now been released through Freia music. As the label specialises in Vinyl, the album was released as a combi pack containing an 11 song double album on vinyl plus a nine track version of the album on CD. but if you take the time to listen to this album several times then it’s definitely worth it. There’s a real range of sounds in the album – acoustic guitar with a Spanish feel, sections that feel more like Jazz than Prog, and the use of instruments such as the Erhu (also called a Chinese spike fiddle), Double Bass plus various guitars and bass guitars mean there’s even more variety than you’d expect. A complex and extremely good album.